To identify senior-level subject matter experts that can effectively combine their hands-on industry experience with Soltec’s Best Practice Solution™ Packages, IT Infrastructure & Implementation Methodology to deliver high-impact business process consulting services and implement industry proven end-to-end Best Practice Solutions™. What is the Soltect Business Affiliate Program? Soltec’s Business Affiliate program allows Independent Consultants to work on their own client projects as well as use Soltec’s trademarks, established name and strong reputation to strengthen their product & solution offerings to potential clients. Soltec Affiliates achieve greater success much quicker than independent consultants attempting to start their own business from the ground up because of the intellectual capital, technology infrastructure and knowledge developed by Soltec principals since the company’s inception in 1991. Simply put, Soltec’s Affiliate Program provides an independent consultant with all of the tools necessary for success in the Business Consulting Field. Research published by The Professional Consultant has shown that Independent Consultants earning greater than $150,000 annually market their products & services differently than those earning less than $75,000 annually. 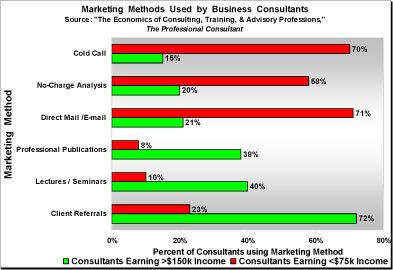 The research showed that Consultants earning greater than $150,000 annually most commonly use Soltec’s three primary marketing methods-Lectures & Seminars, Professional Publications, Client Referrals to attract and retain new clients. All Soltec Affiliates have access to the benefits of these marketing methods. 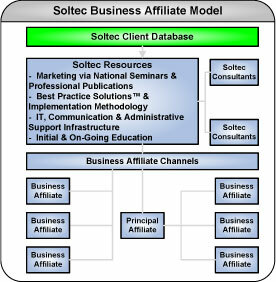 Please contact Soltec for complete information on the Soltec Business Affiliate program.